About "A Rabbi Looks At the Last Days: Surprising Insights on Israel, the End Times and Popular Misconceptions"
Customer Reviews For "A Rabbi Looks At the Last Days: Surprising Insights on Israel, the End Times and Popular Misconceptions"
I liked how this book was easy to read and covered a lot of topics about the Jews, Christians and Israel. 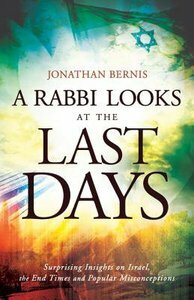 Jonathan Bernis doesnt get into too much interpretation of prophecy and mainly points to the things happening among the Messianic communities and I love the documentation of miracles which is a huge sign of the times. It was good to learn more about Jonathan in his anecdotes and to have an easy reference of verses about Messiah from the Tnach. There is good news all through this book!